Home / Press / Jump-start your energy & lifestyle in 2019! Yes we know everyone else is winding down for the holidays. That’s why we thought it was a cool idea to jump-start 2019 way ahead of time so you know that by the time the festive season is over, you’re already getting into the flow of things and brimming with energy. Did you know your brain is made up of 85% water? And even though it’s mostly composed of water, it still needs optimal hydration on a daily basis to function properly. Not able to focus, pay attention for longer than 30 seconds, or remember why you walked into a room? Dehydration has a serious impact on brain function causing impairment to your attention span, short and long term memory and especially mathematical abilities. Not drinking sufficient quantities of water causes your brain to shut down resulting in symptoms such as brain fog, focus issues, exhaustion, headaches and lack of mental clarity and acuity. You just have to be 1% dehydrated to experience a 5% decrease in cognitive function. And chronic dehydration can lead to your brain shrinking, causing premature aging of the brain! When your brain is functioning on a full reserve of water, you’ll think faster, be more focused, and experience greater clarity and creativity. Your body is mostly (50 to 70 percent) water. Exactly how much water depends on how old you are and how much muscle and fat you have. (In case you were wondering, muscle contains more water than fat tissue). As much as three-quarters of the water in your body is in intracellular fluid, that’s the liquid inside body cells. Your body uses this water to remove waste, regulate temperature, carry nutrients to cells, digest food and lubricate joints. 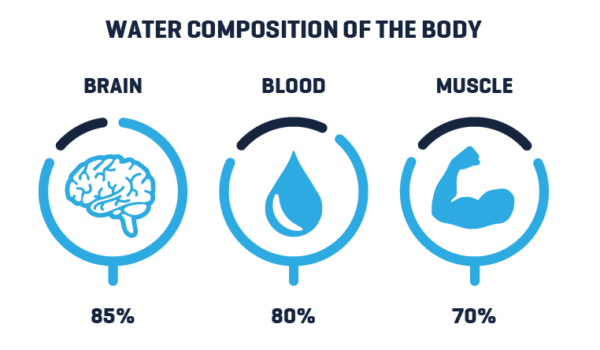 Can you see how water needs to flow throughout your body to keep you energised and healthy? Your body is made to move! Too many of us are spending way too much time sitting in front of our screens at work. And we all know how too much sitting is bad for our posture, circulation, metabolism and can lead to serious chronic health problems. Water and movement are key to keeping your mental and physical energy flowing. That’s why we’ve partnered with the award-winning Deskstand company who are giving away a Jumbo deskstand! This ergonomically designed, fully height-adjustable desk stand offers the balance your body needs by giving you a healthier posture. Can be adjusted for both standing and sitting positions. It’s perfect for those multi-tasking individuals who need a dual-screen sit-stand workstation with more space for a separate monitor or two, along with a built-in cable manager and smartphone/tablet holder. Deskstand are also giving away a Gorilla-Grip – Anti-Fatigue Comfort Mat which helps to reduce strain on your legs while standing for up to 4 hours per day. Deskstand is changing the way we choose to work so much that their products are now endorsed by chiropractors and are increasingly associated with wellness and leading a healthy lifestyle. 1 x 1L KURO-Bō Gō-Ecō Glass Water Bottle along with Activated Charcoal Kōins – the perfect desk-mate to keep by your side as you work making sure you keep your hydration up. Get a head start on the new working year. Imagine starting 2019 with everything you need to achieve your goal of a healthy work-balance now – and in such GORGEOUS STYLE too. Here’s your chance to win this fabulous combo worth R4400 now. All you need to do is enter your best email address here and thats it. YAY! Previous post: Enjoy your Summah with KURO-Bo. Naturally. 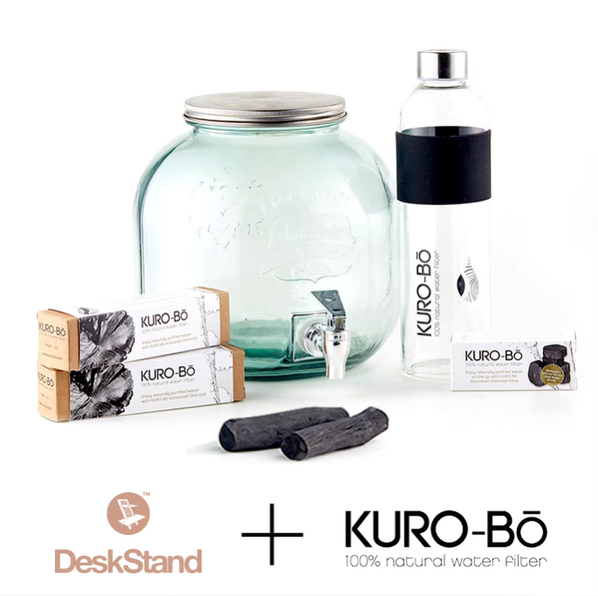 Thank you Kuro Bo for bringing us such a wonderful lifestyle innovation!